Ideal for igniting fires, even on windy and wet days. Suitable for fireplaces, woodstoves, charcoal grills or campfires. Our(ETL certified) Ventless Gel Fireplaces provide the warmth and cozy atmosphere of a fire without the mess or expense of traditional fireplaces. No venting, chimney or expensive gas hook-up is required to enjoy your gel fuel fireplace. They are recommended for use with Paramount Eco Logo ethanol indoor gel fuel. EcoLogo<sup></sup> is North America's oldest and most trusted environmental leadership certification mark Paramount gel fuel is simple,safe and effective. Gel Fireplaces are one of the fastest growing trends in green alternative heating solutions. Easy to install & portable - enjoy your gel fireplace from room to room. This Pine Mountain<sup></sup> Classic Firelogs provide soothing warmth and comfort. Add glowing warmth to chilly evenings at home, or create an inviting ambiance at special get-togethers. Each log lights easily and quickly. Pine Mountain<sup></sup> Classic Firelogs are greener and burn cleaner than cordwood, producing up to 80% LESS Carbon Monoxide*, and up to 75% LESS Particulate Matter*. A box of 10 with 3 hour firelogs. 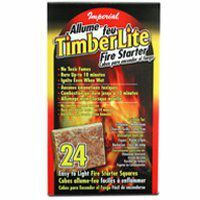 TIMBERLITE Firestarter Sq /12 Ideal for igniting fires, even on windy and wet days. Suitable for fireplaces, woodstoves, charcoal grills or campfires.